a sac formed by the localized dilatation of the wall of an artery, a vein, or the heart. Classification of aneurysms. 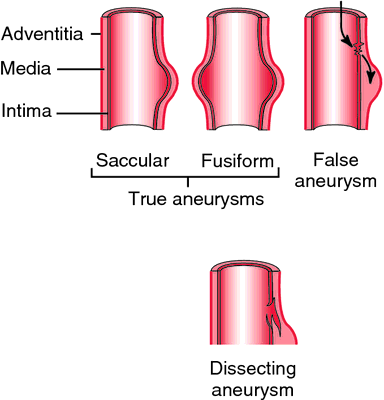 All three tunica layers are involved in true aneurysms (fusiform and saccular). 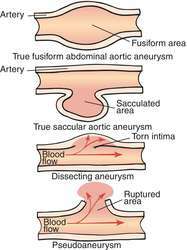 In false aneurysms, blood escapes between tunica layers and they separate. If the separation continues, a clot may form, resulting in a dissecting aneurysm. From Copstead and Banasik, 2000. adj., adj aneurys´mal. The chief signs of an arterial aneurysm are the formation of a pulsating tumor, and often a bruit (aneurysmal bruit) heard over the swelling. Sometimes there are symptoms from pressure on contiguous parts. The most common site for an arterial aneurysm is the abdominal aorta. A true aneurysm results from formation of a sac by the arterial wall with at least one unbroken layer. It is most often associated with atherosclerosis. A false aneurysm usually is caused by trauma. In this case, the wall of the blood vessel is ruptured and blood escapes into surrounding tissues and forms a clot. Because of pressure within the clot arising from the heart's contractions, the clot often pulsates against the examiner's hand as does a true aneurysm. Although atherosclerosis is responsible for most arterial aneurysms, any injury to the middle or muscular layer of the arterial wall (tunica media) can predispose the vessel to stretching of the inner and outer layers of the artery and the formation of a sac. Other diseases that can lead to an aneurysm include syphilis, cystic medionecrosis, certain nonspecific inflammations, and congenital defects in the artery. It is possible for a person to be unaware of a small aneurysm for years. About 80 per cent of all abdominal aneurysms are palpable and may be noticed on a routine physical examination. One should be particularly alert to the possibility of an aneurysm in persons with a history of cardiovascular disease, hypertension, or peripheral vascular disease. Aneurysms tend to increase in size, presenting a problem of increasing pressure against adjacent tissues and organs and a danger of rupture. When an aneurysm ruptures, a critical situation ensues. The patient with a ruptured aortic aneurysm exhibits severe pain and blood loss, leading to shock. A ruptured cerebral aneurysm produces neurologic symptoms and can resemble the clinical picture of stroke syndrome. Treatment of aneurysm depends on the vessel involved, size of the aneurysm, and general health status of the patient. arteriosclerotic aneurysm an aneurysm arising in a large artery, most commonly the abdominal aorta, as a result of weakening of the wall in severe atherosclerosis; called also atherosclerotic aneurysm. arteriovenous aneurysm an abnormal communication between an artery and a vein in which the blood flows directly into a neighboring vein or is carried into the vein by a connecting sac. bacterial aneurysm an infected aneurysm caused by bacteria. berry aneurysm (brain aneurysm) a small saccular aneurysm of a cerebral artery, usually at the junction of vessels in the circle of Willis; such aneurysms frequently rupture, causing subarachnoid hemorrhage. Called also cerebral aneurysm. cardiac aneurysm thinning and dilatation of a portion of the wall of the left ventricle, usually a consequence of myocardial infarction. cirsoid aneurysm dilatation and tortuous lengthening of part of an artery; called also racemose aneurysm. compound aneurysm one in which some of the layers of the wall of the vessel are ruptured and some merely dilated; called also mixed aneurysm. dissecting aneurysm one resulting from hemorrhage that causes lengthwise splitting of the arterial wall, producing a tear in the inner wall (intima) and establishing communication with the lumen of the vessel. It usually affects the thoracic aorta (see aortic dissection) but can also occur in other large arteries. See illustration. one in which the entire wall is injured and the blood is contained by the surrounding tissues, with eventual formation of a sac communicating with the artery (or heart). See illustration. fusiform aneurysm a spindle-shaped aneurysm; see illustration. infected aneurysm one produced by growth of microorganisms (bacteria or fungi) in the vessel wall, or infection arising within a preexisting arteriosclerotic aneurysm. mycotic aneurysm an infected aneurysm caused by fungi. saccular aneurysm (sacculated aneurysm) a saclike aneurysm; see illustration. varicose aneurysm one formed by rupture of an aneurysm into a vein. (an'yū-rizm), Avoid the misspelling aneurism. Circumscribed dilation of an artery or a cardiac chamber, in direct communication with the lumen, usually resulting from an acquired or congenital weakness of the wall of the artery or chamber. aortic aneurysm aneurysm of the aorta. arteriosclerotic aneurysm an aneurysm arising in a large artery, usually the abdominal aorta, as a result of weakening of the wall in severe atherosclerosis. arteriovenous aneurysm abnormal communication between an artery and a vein in which the blood flows directly into a neighboring vein or is carried into the vein by a connecting sac. berry aneurysm a small saccular aneurysm of a cerebral artery, usually at the junction of vessels in the circle of Willis, having a narrow opening into the artery. compound aneurysm one in which some of the layers of the wall of the vessel are ruptured and some merely dilated. dissecting aneurysm one resulting from hemorrhage that causes longitudinal splitting of the arterial wall, producing a tear in the intima and establishing communication with the lumen; it usually affects the aorta (aortic dissection). 1. one in which the entire wall is injured and the blood is retained in the surrounding tissues; a sac communicating with the artery (or heart) is eventually formed. racemose aneurysm dilatation and tortuous lengthening of the blood vessels. saccular aneurysm , sacculated aneurysm a distended sac affecting only part of the arterial circumference. varicose aneurysm one in which an intervening sac connects the artery with contiguous veins. An abnormal, blood-filled sac formed by dilation of the wall of a blood vessel or heart ventricle, most commonly the abdominal aorta and intracranial arteries, resulting from disease or trauma to the wall, as in atherosclerosis. a localized dilation of the wall of a blood vessel. It may be caused by atherosclerosis and hypertension, or less frequently, by trauma, infection, or a congenital weakness in the vessel wall. Aneurysms are common in the aorta but also occur in peripheral vessels, especially in the popliteal arteries of older people. A sign of a large arterial aneurysm is a pulsating swelling that produces a blowing murmur on auscultation. Small aneurysms may produce no sound at all. An aneurysm may rupture, causing hemorrhage, or thrombi may form in the dilation and give rise to emboli that may obstruct smaller vessels. Aneurysms are usually named by the area in which they occur. Kinds of aneurysms include aortic, bacterial, berry, cerebral, compound, dissecting, fusiform, mycotic, racemose, Rasmussen's, saccular, varicose, and ventricular aneurysm. Also called vascular tumor. See also pseudoaneurysm. aneurysmal, adj. A lesion characterised by a weakness in the wall of an artery, vein, or cardiac ventricle, resulting in blood-filled dilation or ballooning, or splitting of the wall. Pulsating mass, bruit (aneurysmal bruit over the swelling), ± symptoms from pressure on contiguous parts. Surgery A weakened or attentuated site on the wall of an artery, a vein or the ventricle, which has stretched or ballooned and filled with blood or, in an artery, resulting in a splitting of the wall, leading to pooling of blood in the vessel wall Clinical Pulsating mass, bruit–aneurysmal bruit over the swelling, ± symptoms from pressure on contiguous parts. See Abdominal aortic aneurysm, Aortic aneurysm, Berry aneurysm, Cerebral aneurysm, Mycotic aneurysm, Ruptured aortic aneurysm. 1. A localized dilation of a blood vessel, usually due to an acquired or congenital weakness of the wall of the blood vessel. 2. Circumscribed dilation of a cardiac chamber usually due to an acquired or congenital weakness of the wall of the heart. As people age, the combined effects of high blood pressure and atherosclerotic weakening of arteries produce most aneurysms in the aorta. Congenital malformations of arteries in the circle of Willis are relatively common causes of aneurysms in the brain. Aneurysms in the chest or peripheral arteries are sometimes caused by blunt trauma or by bacterial or mycotic infection. A localized dilatation (saccular, fusiform, or dissecting) of the wall of the abdominal aorta. It is generally found to involve the renal arteries and frequently the iliac arteries. Occasionally the dilatation can extend upward through the diaphragm. The patient is usually asymptomatic, and diagnosis is made accidentally during a routine physical examination or abdominal x-ray or during screening of the elderly hypertensive male. Serial ultrasounds confirm the diagnosis and determine the size, shape, and location of the aneurysm. Small, asymptomatic aneurysms may be followed over time, rather than repaired (see below). Computed tomography, magnetic resonance imaging, or aortography may assist in confirming the diagnosis and the condition of proximal and distal vessels. Symptoms, when present, include generalized abdominal pain, low back pain unaffected by movement, and sensations of gastric or abdominal fullness. Sudden severe lumbar or abdominal pain radiating to the flank and groin, esp. if associated with tachycardia and hypotension, may indicate enlargement or imminent rupture. Signs can include a pulsating mass in the periumbilical area and a systolic bruit over the aorta. Untreated abdominal aortic aneurysms gradually enlarge and in some instances rupture. The likelihood of rupture increases for aneurysms that are larger than 5.5 cm. Surgical repair is recommended for all aneurysms larger than 6 cm. If an aneurysm is tender and known to be enlarging rapidly (no matter what its size), surgery is strongly recommended. Surgical therapy consists of replacing the aneurysmal segment with a synthetic fabric (Dacron) graft. Immediate surgery is indicated for a ruptured aortic abdominal aneurysm. An alternative treatment to traditional laparotomy is to insert a bypass graft percutaneously into the aorta. In acute dissection of an abdominal aortic aneurysm, oxygenation, blood pressure and cardiac rhythm are closely monitored, and a pulmonary artery line may be inserted to monitor hemodynamics. The patient is observed for signs of rupture, which may be fatal. He will require an intravenous line via a large-bore catheter, a urinary catheter, and an arterial line and pulmonary artery catheter to monitor fluid and hemodynamic balance. Additionally, cardiac monitor electrodes will be placed, and a nasogastric tube inserted. Prescribed medications are administered to manage contributory factors such as hypertension and hypercholesterolemia; a beta-adrenergic blocking agent may be prescribed to reduce the risk of expansion and rupture. The patient is instructed in their use and taught about adverse effects that should be reported. In acute aortic rupture, admission to the intensive care unit is arranged, a blood sample is obtained for typing and cross-matching, and a large-bore (14G) venous catheter is inserted to facilitate blood replacement. The patient is prepared for and informed about elective surgery if indicated or emergency surgery if rupture occurs. The patient will require an intravenous line via a large-bore catheter, a urinary catheter, and an arterial line and pulmonary artery catheter to monitor fluid and hemodynamic balance. Additionally, cardiac monitor electrodes will be placed, and a nasogastric tube inserted. During surgery the patient will be intubated and mechanically ventilated, and such therapies will most likely still be in place postoperatively in the ICU. Desired outcomes include the patient's ability to express anxiety, use support systems, and perform stress reduction techniques that assist with coping; demonstrated abatement of physical signs of anxiety; avoidance of activities that increase the risk of rupture; understanding of and cooperation with the prescribed treatment regimen; ability to identify indications of rupture and to institute emergency measures; maintenance of normal fluid and blood volume in acute situations; and recovery from elective or emergency surgery with no complications. Generally post-operative patients are assisted to ambulate by the second day after surgery. Pain management and psychological support are extremely important during the acute postoperative period. Because of the relatively high incidence of AAA in men over age 60 (esp. smokers or men with intermittent claudication) and patients with myesthenia gravis, screening for AAA is recommended for these people. An aneurysm of congenital or traumatic origin in which an artery and vein become connected. Symptoms may include pain, expansive pulsation, and bruits or, occasionally, high-output heart failure. Aneurysm due to degeneration or weakening of the arterial wall caused by atherosclerosis. A small saccular congenital aneurysm of a cerebral vessel. It communicates with the vessel by a small opening. Rupture of this type of aneurysm may cause subarachnoid hemorrhage, a devastating form of stroke. Aneurysm of a blood vessel in the brain. A dilatation of a network of vessels commonly occurring on the scalp. The mass may form a pulsating subcutaneous tumor. Aneurysm in which some of the layers of the vessel are ruptured and others dilated. Aneurysm in which the blood makes its way between the layers of a blood vessel wall, separating them; a result of necrosis of the medial portion of the arterial wall. 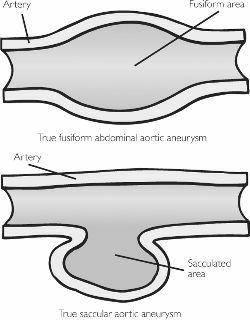 See: aortic aneurysm for illus. Aneurysm in which all the walls of a blood vessel dilate more or less equally, creating a tubular swelling. Aneurysm due to bacterial infection. Aneurysm in which there is weakness on one side of the vessel; usually due to trauma. It is attached to the artery by a narrow neck. Aneurysm forming a blood-filled sac between an artery and a vein. Localized expansion and weakening of the wall of a vein. A berry-like or diffuse swelling on an artery, usually at or near a branch, and caused by localized damage or weakness to the vessel wall. Aneurysms can also involve the heart wall after a section has been weakened. See also BERRY ANEURYSM. The term derives from the Greek anaeurusma , a widening. dilation of an artery wall, a sac formed by abnormal dilation of the weakened wall of a blood vessel. A weak point in a blood vessel where the pressure of the blood causes the vessel wall to bulge outwards. An aneurysm may also appear as a sac-like projection from the blood vessel wall. n bulging area of a blood vessel wall caused by weakness, or thinning in the wall's structure. A localized dilatation of the walls of a blood vessel, usually an artery, as a result of infection, injury or degeneration. It is filled with fluid or clotted blood. Aneurysms occur in diabetic retinopathy, and retinal veinocclusion leading to haemorrhages and oedema. (an'yūr-izm) Avoid the misspelling aneurism. n a localized dilation of an artery in which one or more layers of the vessel walls are distended. a sac formed by the localized dilatation of the wall of an artery, vein or the heart. an abnormal communication between an artery and a vein in which the blood flows directly into a neighboring vein or is carried into the vein by a connecting sac. one arising as a result of weakening of the tunica media in severe atherosclerosis. an infected aneurysm caused by bacteria. a small saccular aneurysm of a cerebral artery, usually at the junction of vessels in the circle of Willis; such aneurysms frequently rupture, causing subarachnoid hemorrhage. Called also brain aneurysm. thinning and dilatation of a portion of the wall of the left ventricle, usually a consequence of myocardial infarction. dilatation and tortuous lengthening of part of an artery. one in which some of the layers of the wall of the vessel are ruptured and some merely dilated. Called also mixed aneurysm. observed sporadically in the aorta and pulmonary artery. one resulting from hemorrhage that causes lengthwise splitting of the arterial wall, producing a tear in the inner wall (intima) and establishing communication with the lumen of the vessel; it usually affects the thoracic aorta. Seen most commonly in horses and caused by larvae of Strongylus vulgaris. See strongylosis. A specific disease of turkeys. one produced by growth of microorganisms (bacteria or fungi) in the vessel wall, or infection arising within a pre-existing arteriosclerotic aneurysm. causes a high mortality rate in the affected cattle breed. The defect is in the abdominal aorta. may result from the lodgement of pulmonary emboli; rupture and pulmonary hemorrhage are potential sequelae. an infected aneurysm caused by fungi. one formed by rupture of an aneurysm into a vein. See also aneurysmal varix. Q. What are the causes of aneurysm? A. An aneurysm is usually a congenital malformation of the blood vessels (meaning you are born with it), and there's not a certain cause for it, although high blood pressure, stress or atherosclerosis can trigger it to rupture and that is the danger. Q. Can an aneurysm repair it self on her own? A friend of mine was diagnosed with an aneurysm. At first he was sure he is going to have a surgery, but afterwards his doctor told him he should get medical treatment. I don't understand - how come some people need a surgical repair while others just take medications? I know this is a serious condition that is life threatening can an aneurysm repair it self on her own? Or maybe when his doctor didn't recommend surgery he malpractices? the reason that I ask is that all the other people that I heard of that had an aneurysm had a surgery, and I don't really trust this doctor. A. There can be several reasons why an aneurysm is not operatable. It can be its anatomic location, it can be its size or maybe its just to dangerus to oprate because of other diseases your friend suffer from. Anyway if you want you can go to your GP and ask him why didn't he offer you the surgical treatment. Q. Could I be going through a Brain aneurysm? i woke up in the night with a bad headache in the back of my head and above my eye. never had a headache like that. but all day today have not had the headache. could this be an aneurysm? A. I had an brain anyuism in 2001. I had a head ache right above my left eye for 10 days. It got worse as the days went by. I went in to the emergency room and they gave me a spinal tap and it ruptured.Thank God that it cloted (that dos'nt happen). But it did and they did emergency surgury. I am alive and back to normal today. My parents both died of brain anyuisms. That is how huretaty starts.